Did you know that 98% of clothing bought in the US is not made in America? Fifty years ago, only 5% of clothing bought here was made elsewhere. The process of globalization (increased economic ties between nations) and free-trade policies account for this dramatic shift; over the past half-century, Western manufacturers discovered that paying foreign workers in developing countries a fraction of the wages U.S. workers require resulted in massive profits for shareholders while keeping costs low for consumers. These foreign workers are practically slave laborers, working in terrible conditions at low pay. By purchasing goods made in developing countries, your dollars are funding the exploitation of millions of people abroad. 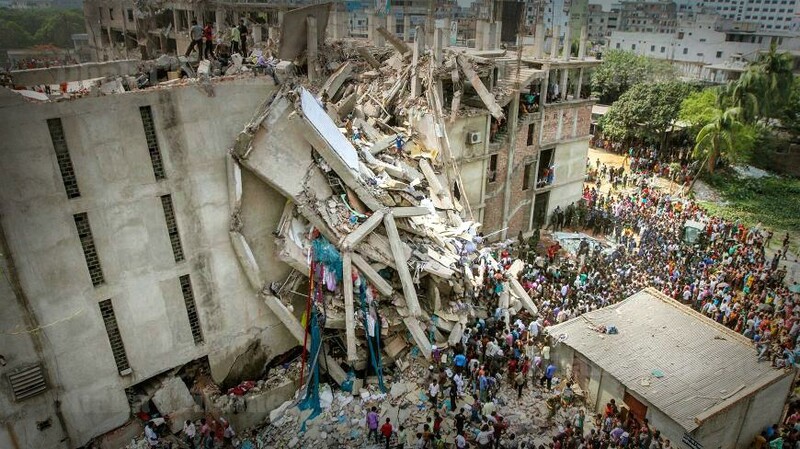 On April 24, 2013, the Rana Plaza garment factory in Savar, Bangladesh collapsed, killing over 1,100 people and injuring 2,500 more. It is the deadliest garment factory disaster in history, yet it was but one disaster among many that plagued the garment factory industry worldwide. Many Western retailers, including J.C. Penney and Wal-Mart, manufactured their products at the complex. One year after the disaster, Bangladesh was 3rd among all countries in clothing exports to the U.S., and the clothing industry accounted for 14% of total GDP in 2016 and 77% of its total exports . Like many developing countries, Bangladesh is a source of cheap labor and materials for Western corporations who license thousands of factories in these countries. It is important to note that many factors contributed to the horrifying loss of life and injuries in this disaster: the factory manager refused to allow workers to leave when smoke was discovered the morning of the fire (other businesses in the complex sent their workers home); the factory itself was an illegal addition to the building that did not have the proper permits; the factory lacked smoke detectors, fire extinguishers, and adequate escape routes . The Rana Plaza garment factory was no exception in the industry, either. Bangladesh had the world’s lowest minimum wage (about $38 a month) in 2013, and workers often worked 80+ hours a week in garment factories . The majority (over 60%) of workers are women with less than a high school education, meaning they have limited options in the workforce other than these factories. Ultimately, compared to American labor standards that offer benefits, pay for overtime, and (generally) provide safe workplaces, the Bangladeshi worker faces extreme conditions, incredibly low pay, and a government that desperately needs foreign retailers to keep their factories in the country. To ensure that disasters like Rana Plaza don’t happen again, there are three approaches available to consumers, retailers and Congress that can help improve conditions for workers in countries like Bangladesh: retailer initiative, Congressional action, or consumer-driven solutions. Following the disaster in 2013, Western retailers voluntarily launched two initiatives to improve standards in their Bangladesh factories: the Accord on Fire and Building Safety in Bangladesh (involving European retailers) and the Alliance for Bangladesh Worker Safety (for American retailers). Both programs called for improvements in occupational safety standards, increased inspections, and greater cooperation between retailers and the Bangladesh government with a goal of massive improvement by 2018 . With that deadline approaching, however, conditions in these factories are still substandard, and labor activists warn that factories who don’t adhere to the newer standards will simply be removed from Western oversight and fall under the Bangladeshi government’s state-run initiative, which is lax compared to the two retailer accords. Congress could get involved, mandating higher safety standards in American-licensed factories while threatening retailers with tax penalties for non-compliance. Following a factory fire in Tazreen in 2012, the public discovered that uniforms for the U.S. Marine Corps were being manufactured in these sweatshops. The Department of Defense denied knowledge that these uniforms were being made overseas, but labor activists in the U.S. were concerned, and Democrats tried to include a provision in the 2014 National Defense Authorization Act that would have required exchange stores on U.S. military bases give preference to suppliers adhering to the Accord (European plan) . U.S. retailers pressured Congress and the provision was dropped. 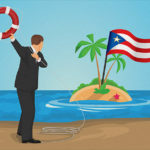 Despite the Trump administration’s stated “Buy American” plan, it is difficult to imagine the White House or Congress taking action on the issue in the near future. Given this reality, consumers have the most power to actually influence retailer behavior. The two most important questions on this assure are: should we, as consumers, care about conditions in overseas factories that make the products we consume? And who is responsible for the problem? Some people, especially within the retail industry, place the blame entirely on the factory owners themselves, the Bangladeshi government, or a combination of the two. Others acknowledge that conditions in these factories are poor, but argue that they still provide economic opportunity to workers who have few other options, and that the shift from American-made to foreign-made consumer goods is a natural consequence of neoliberal trade policy that nevertheless brings massive benefits to all involved. My answers to the questions are: Yes, consumers should be concerned about the plight of foreign workers who make our products; and the largest portion of blame lies with Western retailers who enable the exploitation of foreign workers and profit from their misery. The biggest resistance to reform within the industry is the argument that doing so would be prohibitively expensive and that retailers are unaware of the abuses going on in their factories . This behavior is simply unacceptable in a decent society that would be outraged if a similar industrial disaster had occurred in America. Companies like Wal-Mart, J.C. Penney, and other retailers have seen massive profits over the past few decades, and the idea that enforcing safety standards in their factories would put them out of business is not only untrue, but downright cynical. Consumers must therefore make their voices heard through the power of the purse: we must boycott retailers that don’t adhere to the Alliance by 2018 and support the efforts of labor activists and Congressional Democrats who are searching for a legislative solution to the problem. Buy your clothing second-hand. Whether you buy them from thrift stores or from online markets like eBay, second-hand garments don’t result in more additional profits for retailers who fail to enforce decent standards in their factories. Additionally, considering donating or selling your gently-used clothing to others for these reasons. Support groups like the Worker Rights Consortium who advocate for worker rights globally. Visit http://www.workersrights.org/ for more information. Additionally, pressure your elected representatives to: support efforts to enforce higher safety standards in foreign factories, keep manufacturing jobs in the U.S., and oppose policies that incentivize turning a blind eye to deplorable factory conditions in sweatshops abroad. Saiful Islam, M & Abdur Rakib, Md & Adnan, Atm. (2016). Ready-Made Garments Sector of Bangladesh: Its Contribution and Challenges towards Development *. Journal of Asian Development Studies (JADS). 5. 12. Anthony Fitch is a Policy Corner for PVNN. He obtained a BA in Government and Rhetoric at the University of Texas in Austin. He also obtained an MA in English at the University of Texas in San Antonio with a focus on Post-Colonial Studies. His areas of interest are international relations, U.S. foreign policy, and defense. Anthony is a proponent of regional and transnational cooperative bodies for promoting peace and mutual prosperity among member nations. He also advocates for human rights issues as they relate to America's interactions with allies, partners and rivals on the global stage. Domestically, Anthony aims to promote civil discourse and intellectual honesty in our discussions of policy issues, and opposes the hyper-partisanship of American politics in general.